International Women’s Day was created by the struggle of working women right here in the U.S. On March 8, 1908 a powerful protest of women garment workers took place in New York City. They went on strike for 13 cold winter weeks and in the end they won. Inspired by this struggle, the outstanding German revolutionary Clara Zetkin proposed at a gathering of socialist women that March 8 be celebrated as International Women’s Day. 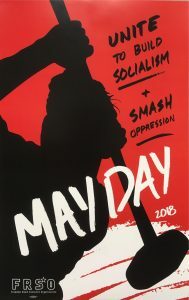 This year International Women’s Day events will be held across the globe, in the socialist counties like Cuba and Vietnam and in the countries oppressed by imperialism like Palestine and the Philippines. It will be celebrated here in the U.S. as well. We urge all progressive people to organize events to mark International Women’s Day. As a part of these events we urge you to speak out in support of Palestinian American leader Rasmea Odeh, and demand that the outrageous charges against her be dropped. As a part of the repression that the U.S. government has unleashed against Palestinian and Palestine solidarity activists, the Justice Department is trying to jail, and then deport, this heroic sister. Rasmea Odeh is the Associate Director of the Arab American Action Network and won the “Outstanding Community Leader Award” from the Chicago Cultural Alliance in 2013 for her work with the Arab Women’s Committee and other groups. She overcame vicious torture by Israeli military authorities while imprisoned in Palestine in the 1970s,. She is familiar to millions of Palestinians who have not given up organizing for their rights of liberation, equality and return. On International Women’s Day we need stand with women like Rasmea Odeh. They are an example to all of us. As we approach International Women’s Day in 2014, we understand that the system we live under is waging a war on women. There is no equal pay for equal work. There is an epidemic of violence against us. We need full reproductive rights, better health care and a social safety net that ensures our families are taken care of. There are many obstacles to our complete liberation that must be cleared away. In China it is said that “women hold up half the sky.” We know that women have made great contributions to the struggle to end all oppression. Harriet Tubman stood up to slavery and lead the oppressed to freedom. U.S. working class leader Elizabeth Gurley Flynn stood up to capitalism and demanded it be replaces by socialism. And so many more will do so much more. The future is bright! Report on the Labor Movement in the U.S.